All relationships experience distress from time to time. We can become trapped in a negative cycle that prevents our loved ones from hearing our relational needs, giving responsiveness and over time, this can create distrust, disconnect and chip away at our felt sense of safety in our relationship. JHFS can help your relationship get back on track. We provide Emotionally Focused Therapy for couples in distress. Whether your relationship has experienced an attachment injury, such as an affair, substance abuse or other primal hurts, or you are simply seeking to strengthen your bond and protect your attachment, we service the entire spectrum of relational crisis & need to help you get re-connected. EFT is considered the most effective form of couple’s therapy. In EFT we help couples understand the negative pattern that has taken over their relationship and how it impacts things like effective communication, safety, trust, connection and intimacy. 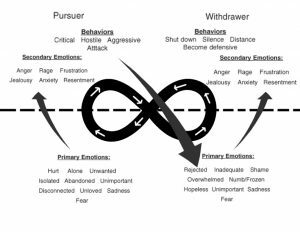 We help couple’s create corrective experiences by tuning into the underlying emotional stories (feeling afraid, alone, rejected, not good enough) that sometimes drive more reactive behavior (yelling, criticism, defensiveness, shutting down, stonewalling). How is EFT different than other couple therapies? Adult attachment relationships are believed to have the same survival function as the mother-child bond, since ideally these attachments can provide the same love, comfort, support, and protection throughout the lifespan. However, due to our relationship histories, and the negative patterns we get into with our partners, many of us have difficulties with trust and expressing emotion to those who mean the most to us. Let us help you fight the negative pattern enemy in your relationship.